1. Day before serving: Wash beans, discarding imperfect ones. Cover beans with 2 quarts cold water; refrigerate, covered, overnight. 2. Next day: Drain beans. Turn beans into 6-quart kettle. Cover with 2 quarts cold water. 3. Bring to boiling; reduce heat, and simmer, covered, 30 minutes. Drain, reserving liquid. 4. Preheat oven to 300F. 5. Trim rind from salt pork. Cut pork almost through, at 1/2 inch intervals. 6. 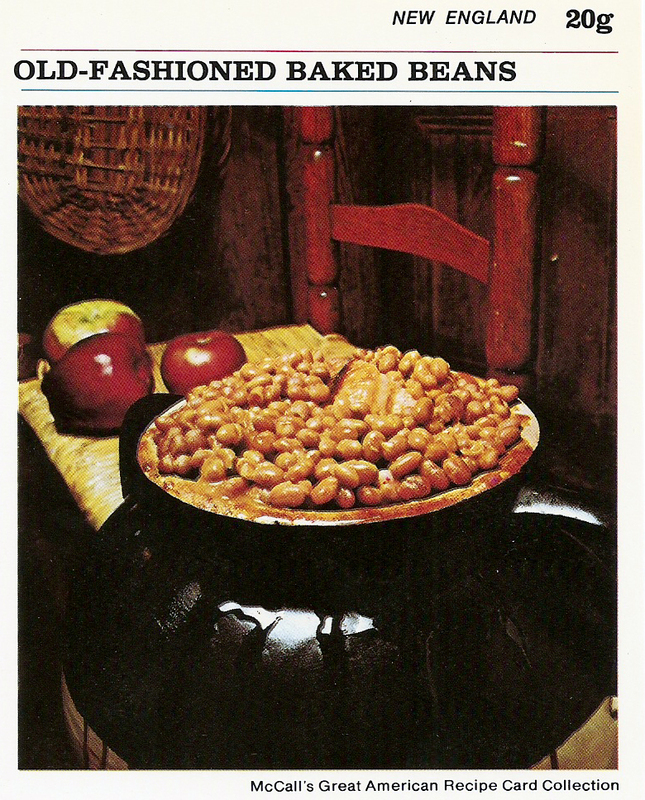 Place onion in bottom of 4-quart bean pot or casserole. Add beans; bury pork, cut side down, in center of beans. 7. Heat reserved bean liquid to boiling. 8. Combine remaining ingredients. Stir in 1 cup boiling bean liquid. Pour over beans. Add about 1 1/2 cups boiling liquid just to cover beans. 9. Bake, covered, 6 hours. Stir once every hour, so beans cook evenly. If they seem dry after stirring, add a little boiling water. 10. To brown top of beans, remove cover for last 30 minutes of baking time. ©Copyright 1973 by The McCalls Publishing Co. All Rights Reserved. Printed in U.S.A.